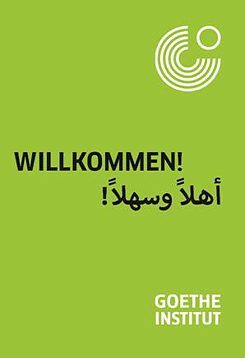 Goethe-Institut The compact language guide is intended to help Arabic-speaking refugees during their initial phase in Germany. It contains important words with pictures as well as relevant everyday dialogues and the respective Arabic translations. 45,000 copies of the language guide have been distributed to initial reception centres in Germany. Due to the large demand, the print edition of the Arabic-German language guide is already out of stock.